The Kellstadt Marketing Group will be hosting their 2015 Marketing Symposium on Saturday, May 9th. I highly recommend that marketing students attend. Overview: The world of marketing is ever changing and it is imperative that as marketers we are able to adapt. This year’s symposium will highlight the key successes and strategies from companies who have been able to maintain their place in the market by rejuvenating their marketing strategy. Our esteemed speakers will give insight to how they were able to give a makeover to traditional marketing campaigns. Coleman Connections Earth Day with Food Entrepreneurs takes place on April 22, 4-5:30pm. This event features leading entrepreneurial startups and small businesses in the "green" food industry. This informal panel discussion will focus on the innovative work that these local entrepreneurs do in the industry and explore ways students can get involved in food-related ventures. A Chipotle representative will also be present to talk about the green initiatives of a large-scale food company. The event will be held in the Lincoln Park Student Center, Room 220 (located within the cafeteria). 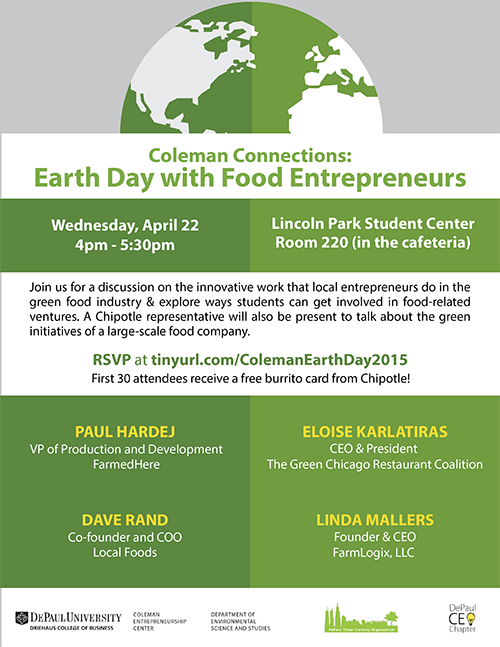 This Coleman Connections event is hosted by the Coleman Entrepreneurship Center, DePaul's CEO Club, DePaul's Urban Farming Organization and the Department of Environmental Science. 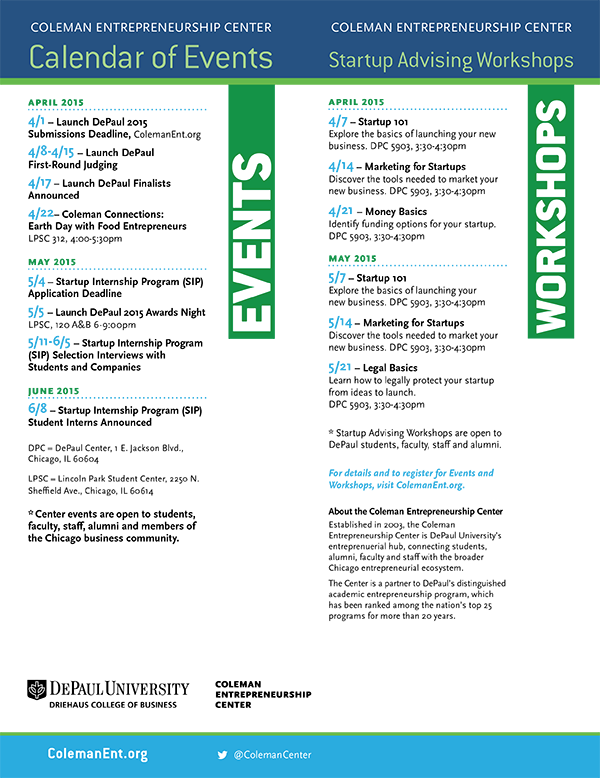 The Coleman Entrepreneurship Center has launched its Spring Quarter events. You can find out more here.